Glass and bronze. Glass is transparent, translucent. Bronze is thick, opaque. Glass suggests air and light. Bronze, weight. Bring these materials together and one finds in the result an engaging blend of aesthetic interplay. Bring them together in the Pozycinski Studio and one finds an artistic balance of media and form. Just as glass and bronze suggest contrast, so too do the forms: simple yet complex, modern yet fraught here and there with glimpses of ancient culture. 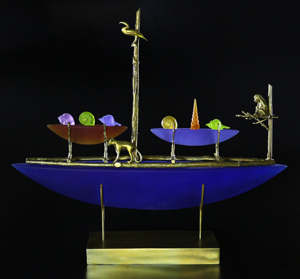 This complementary balance in Joe and Georgia Pozycinski's work - of past with present, of organic form with inorganic media - is itself the result of a long history of creative interests between them.